Hello, and happy Valentine's Day! Okay, it's not quite the big day yet, but February 14th is just days away, and I'm totally ready to celebrate. Ever since the Christmas holiday ended, I've been itching for an excuse to decorate, party, craft - whatever! I wanted to make some cards featuring some of my favorite gals throughout history (some are good, some are bad! ), and the captions kind of wrote themselves after that. Click through for these printable valentines! Keep scrolling to download this free Father's Day card! Some people call him "sir," others "chief." Still others see him as "hero," as in "I never would have gotten [fill-in-the-blank] done without him." Sure, he could be all of those things to you, too, but you're also the lucky duck who also gets to call him Dad. That's how one Washington state woman felt about her pop, a Civil War veteran and widower who raised her and five brothers—so much so that she rallied for a day of officially recognized commemoration, and won it in 1910. Hitting the campaign trail to create a special holiday has already been done, so now you can devote all your effort to making sure your dad gets singled out for all the good about him—and what better way to kick it off than with a card? Fathers Day cards are the embodiment of a host of strong and sometimes complicated emotions, but regardless of the state of your relationship, every dad appreciates a nod of appreciation. Read on for our curated selection of printable Fathers Day cards, cards you can buy online, and some tips on what to put in that card before you deliver it! Mother's Day is just around the corner (it's on Sunday the 14th - don't forget!). If you're anything like me, the holiday has crept up on you. There are so many different things to celebrate about our mamas (and grandmothers, spouses, and mother-figures), but what it ultimately comes down to is telling her you're thankful for her. Whether that means making her breakfast, bringing her flowers, or sending her a note in the mail, these (free!) Mother's Day printables can help you get the job done. Can you believe how quickly December is flying by?! Before I knew it, Christmas cards started arriving in the mail and I realized I had nowhere to display them. In our small apartment, it can be difficult to find space, so I decided to utilize an existing frame on a table to make this DIY framed web card holder that would be easy to store away for next season or repurpose for other items. Show your leading lady just how much you care (or how refined your sense of humor is) with one of these clever Valentine's Day cards. Carina from Crow and Canary rounds up 10 of her faves below -- check it out! Valentine's Day is right around the corner and, whether you're making or giving gifts (or not! ), a clever card always goes a long way! 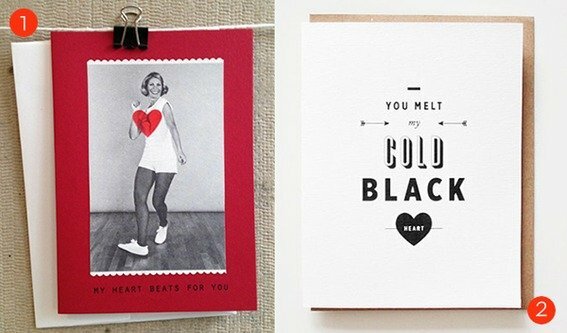 This year, we turn to our favorite stationery connoisseur, Carina of Crow and Canary, for her top ten Valentine's Day cards for guys! Enjoy! It's February 1st, and so we figured it was about time to find this year's most thoughtful and heartwarming greetings for Valentine's Day. But, it's now 2012, it's becoming increasingly difficult to find the best way to say "I love you" at the card store at the mall, or worse, the aisle at the supermarket. Times have changed, and there's a whole world of stationery out there to help you share your warmest thoughts. For help, we turned to our pal Carina Murray of Crow and Canary, an artisanal stationery firm based in Portland, Oregon. First up, we're excited to have Carina share her favorite V-day cards for guys...no fishing poles, footballs, or TVs to be found. But there is pizza. And robots. And bacon. Which is exactly how things should be. The very colorful nature of paint chips make them a perfect medium to make handmade Christmas cards. The first example, pictured above, is a simple design using traditional Christmas colors along with a stamped message. Go here to see what else was used in its construction. When you thought you have seen them all, another pendant light takes the spotlight. This one, made of playing cards, really ups the ante when it comes to DIY lighting. Head's up, friends. Easter is over, spring has sprung, and we're moving on to a whole new season. First up: Mother's Day, which occurs on May 8th this year. To help you celebrate in style, we've asked our friend Carina Murray of Crow and Canary, an artisanal stationery firm based in Portland, Oregon, to share some unique, independently designed and printed cards to share with your cool Mom. Embossed bouquets? No sir. Holiday cards piling up? Here are some cute and clever ways to display them, tutorials included! First up is a bent wire Christmas tree idea from BHG. Mique's Christmas card frame up is made of, among other things, a big frame, ribbon, rick-rack and clothespins. Keep Calm and Carry On. Could there be a more appropriate motivational message for our current economic climate? The people that brought that sentiment back to life have new messages to share. Here are some of my favorites. This business card from AGRIE Paint Services is actually painted over. To reveal the contact information, you must pull off the painter's tape. Clever, huh? How the tape doesn't damage the surface underneath, I'm not sure. A guess....the 'tape' isn't sticky, and the paint itself is holding it in place....? For the past dozen years or so I’ve been making my Christmas cards. Sometimes they’re labor intensive, but they don’t have to be. Case in point: these suggestions from Scrapbooks Etc. A collection of different sized circle punches, some glue and a bow makes up this clever card. A few strips of paper--or ribbon--and you have yourself a Christmas tree card. How to make a â€˜Word Searchâ€™ greeting card! Curbly has siblings. One of them is called Teacherly, and, as you can probably guess, it’s an on-line resource for teachers. However, it also has a very awesomely cool FREE feature called ‘word search creator’. Teachers use such things as word search puzzles as, well, teaching tools, but they also can come in handy for paper crafters too. With a little help from Teacherly, here’s my very easy technique for making a one-of-a-kind greeting card!